The sweetest sound. The sweetest name. How often do we moms hear it? When they are in pain. “Moooommmmmmyyyyyy!” This one makes my heart feel like it is breaking. And unfortunately, is the one that I heard the most in Natalie’s early years. As for me, I grew up calling my own mother, “Mom.” But Natalie has adopted, “Mommy” as my moniker. And it is the sweetest name to touch my ears. 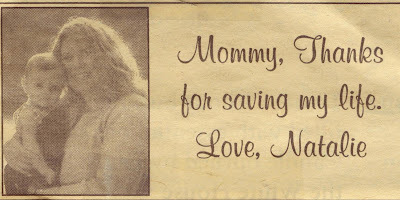 On Mother's Day 2005, just a few months post-transplant, Jason put this in the local paper. It remains my most beloved Mother's Day gift.